Trev back – now more than ever – according to my recent interview with one of the hottest rappers coming out of Colorado right now. In an attempt to reinforce that statement, the Squizzy Gang artist dropped a second single from the third instalment of his highly praised “Heights” series. Produced by BrinkyBeats, “Pain” is a track in which Trev projected that his fans would love most due to its introspective, emotionally resonating nature which seen him suit Joe Budden’s MME group perfectly. As I’m sure is evident by now, after a plethora of positive reviews, I’m a big fan of the “Dreams” rapper but there is a reason I’ve never written a review for the first single – “Go Get It”. Trev Rich is an artist I have often applauded for his consistency in his entire catalogue. Even before “Heights”, Trev was making marvellous music in under the pseudonym of Rockie G5 in the “Gold Dreams” project. Unfortunately, “Go Get It” just wasn’t for me. 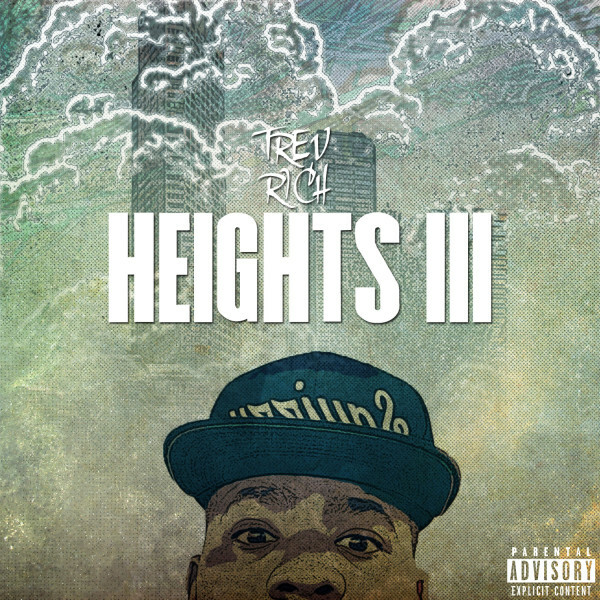 I was reliant upon “Pride” to reinstore my faith for “Heights 3“, and thankfully I was not disappointed. BrinkyBeats is becoming a producer that Trev Rich fans are fast becoming used to, he has created a vast array of amazing instrumentals for the rapper including “Numbers To Letters” and “L.A Interlude”. It appears that Brinky will be a regular name on the “Heights 3” project as he has a produced both singles from the highly anticipated mixtape – to be released on the 19th of November. The “Pain” beat is beautifully pieced together with a blend of delightful drum patterns, captivating piano chords and a sampled voice which isn’t dissimilar to the Ellie Goulding sample on Drizzy and Hov’s “Pound Cake”. The brilliant production provides a phenomenal foundation fit for Trev’s fantastic ability to rip his heart out and lay it in a verse. The layout of the track seems scattered, and that might be the one downfall. I was convinced the sections in which T spits “You don’t wanna be sober, don’t want be hopeless, don’t wanna be lonely no more” was the hook, but turns out a segment saying “I smoke, I drink, I’m supposed to stop but I can’t” might be more appropriate for that title and the former is more of a bridge. Aside from that confusion, Trev’s lyrical contribution throughout the track isn’t far from flawless. The problem with that perception of Trev’s wonderful words is that why would he be “addicted to anything that make the pain go away”? For the record, despite the mention of “you”, I understand that Trev is talking about himself. Is this a case of Trev wishing his career way? I doubt it. So maybe the song is purely a twisted love song, and the “Heights” artist wishes he could make the pain go away for his loved one rather than they turn to drugs and alcohol. But then, isn’t that the beauty of Trev’s music? It’s open to interpretation, and anyone can relate. TREV BACK! What do you think? What is your interpretation of the meaning of the song? Do you like it? Are you excited for “Heights 3”? Let us know in the comments below!